In Oct. and November 2019 the U.S. 10Year-Treasuries reached a yield of ca. 3.25%. Around Christmas Eve the S&P 500 reached then its intermediary LOW at around a level of ca. 2,336 points...(I did not look up the exact level). Just by coincident, that level would be confirmed by the DDM-matrix cross-section of 3,25% (10YR-Treas.) and an EPS-level of ca. 160 USD per S&P 500. 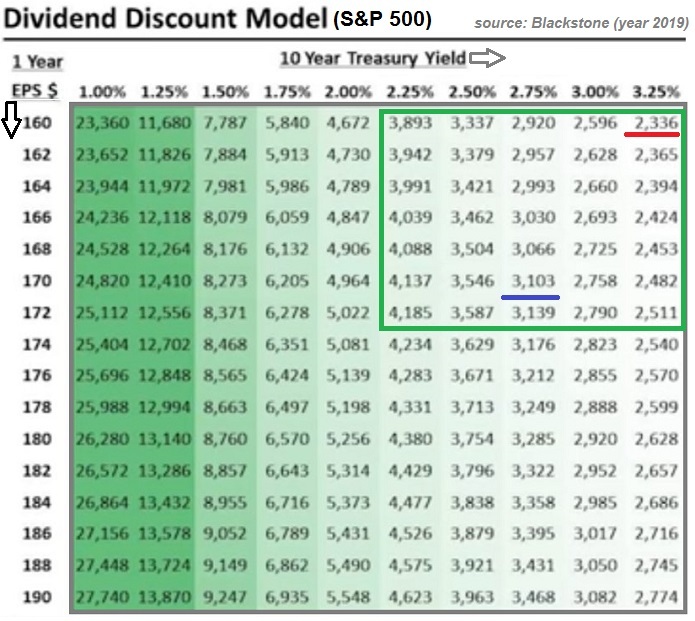 "DDM = Dividend Discount Model"
Now that we are sitting at a 10YR-Treas.-level of ca. 2.50% and a possible S&P 500 earnings-"guess" of ca. 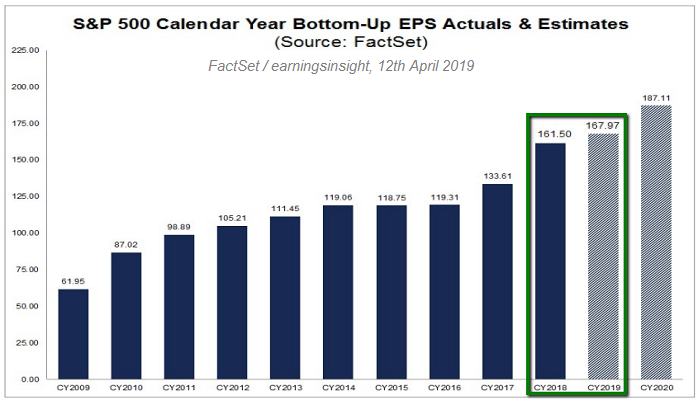 168 USD (see Matrix above and FactSet-estimates in the barchart below) one would reach a potential intersection-point of ca. 3,504 points in the S&P 500 (see Matrix above). (Currently the Dow Jones Industrial Average is sitting at 26,412 point as per market close of Friday, 12th April 2019). WoW - Low interest rates (and bond yields) can really have a big impact on Stock-Market valuations, aka: FAT TAILWIND.